It is one month until showtime, I repeat, one month until showtime! Yes, in one month from now the Eurovision Song Contest 2015 will be broadcast live from Vienna to an expected audience of around 200 million viewers. I have said it before, but it really is like Christmas for Eurovision fans. I think that everybody can agree that once it is all over, it leaves a big hole in our hearts as we wait another year until the next show. All of the excitement building up to the big event and then suddenly before you know it, it’s all over again. So with only a month to go, it’s time for me to review the songs that are being featured in this years contest. You will have to remember that this is purely my views and in no way will it reflect the results of the show itself, nor that of you reading I expect. Nevertheless, I present to you my Top 40 of Eurovision 2015 and countdown all the way to my personal #1 favourite of the competing songs. I can’t really see a winner out of any of those tracks. As you all know, I can’t stand the UK entry but sadly it is not the worst of the bunch featured this year. I have a feeling that Cyprus is going to grow on me a bit before the contest but for now it gets a low placing, in comparison to some of the other ballads featured this year. Oh, and Finland better not qualify this year. This is a great bunch of songs but just not good enough in my eyes. Some of them have potential but in comparison to some of the other entries they fall flat. I am very fond of the Latvia entry and think that this could grow on me before the contest. A great set of songs there which I really like and there is a lot of potential. It was really hard this year to put these songs into an order as they do tend to blend into one another (not in a bad way either). I think out of this lot, Russia, Albania and Austria will probably go up in my ranking before the show and also can bring in a lot of votes on the night. I guess all will be revealed on May 23rd. So it’s time for the biggie, the Top 10. Who is going to be my #1 favourite? Is it the same as yours? Ethno-pop is back in the contest! I really like this Justin Timberlake mixed with Turkish music hybrid. I know this is Israel but this really reminds me of sounds from Istanbul. I think this could stand out and do very well as it is one of the big uptempo numbers this year. I imagine with a great show on the night this could get a lot of televotes, will juries love it though? A personal favourite of mine, I really hope this manages to qualify from the semi-finals. I do love a great rock ballad and I think this song nails it. I would have loved a bigger climax but I still think there is potential for this in the live performance. I think this is the one I will be rooting for and voting for in Semi-Final 2. Great song. Oooh, welcome back Belgium. I say welcome back because I think this is the first time since 2006 that I have really loved a Belgian entry. It is a daring pop song and the singer is rather a unique thing with that voice. I think this could be the dark horse and I can imagine juries loving this song. The bookies favourite, but not quite mine. I do like this song, don’t get me wrong but there is just something that makes me think it does not have the full package to be a winner. I imagine I will be eating my words but I am yet to be blown away by any live performance of this. An amazing little ditty this. I love it’s uptempo vibe and the ability to get your toes tapping along whether you like it or not. I am not fond of the singer wearing headphones constantly but I guess I will just have to accept that is the look they are going for. This is very catchy and could be a surprise winner? I think it’s about time Slovenia do well in the competition. This is closing the show for Semi-Final 1 and I can imagine there will be almighty performance of this. There are two songs called “Warrior” in the contest this year and this is by far the most superior. I love the dubstep breakdown in the middle and I think this will harbour a lot of ex-USSR votes as well. Will be good to see how well this does next month. Sweden are playing with fire with this one. The last time they sung about Heroes was back in 2008 when Charlotte Perrelli crashed and burned and didn’t do so well in the final. Is it a curse or just a one-off horror? I imagine it will be the latter as this is a great song that in all honesty I can see winning and being a big summer hit throughout Europe. Well, I love this song. Between this and Sweden I think that Semi-Final 2 is going to a very close call and fascinating entertainment as to who will end up on top. This has a great wall of sound and I imagine the Azeris will put on an epic show to showcase that. Elnur is a fantastic singer (check out him participating in Eurovision 2008) and I have no doubt that this is going to be Top 3 in the final next month. Will it win though? I usually always love the Italian entries in the contest (apart from last year) and this song is no different. I like how the song builds and builds for a fantastic ending. This is surely going to be somewhere near the top in May and I just hope that it generates more buzz for the Italians watching the show. I wonder what kind of performance they will go for, sophisticated and simple or big and dramatic? Either way, they are heading to the top. So who is my #1? 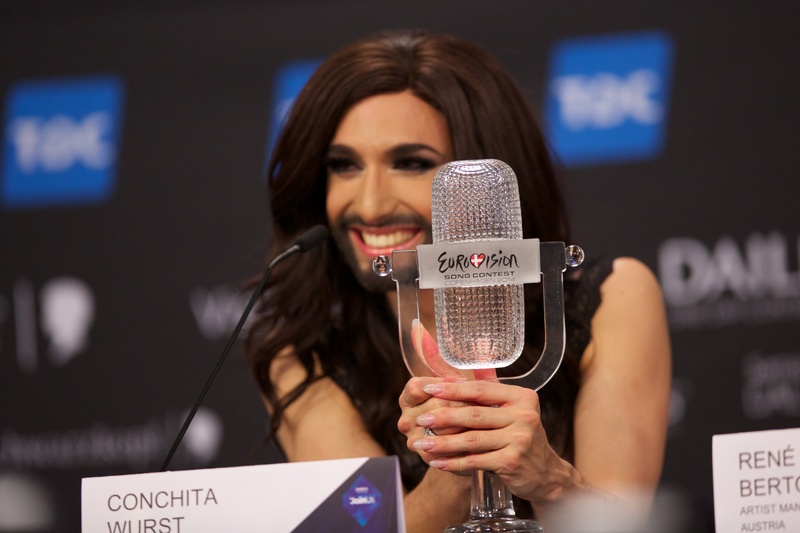 Who in my opinion should take the crown from Conchita Wurst? It’s about time for a countdown video, right? For me, this song has the full package. It is catchy, dramatic and has a great potential for a dazzling performance. I hear that Giuseppe di Bella will be dancing with Edurne on stage and that is a very exciting prospect. To see why I am excited, you only have to see the “Dancing In The Rain” music video from last year where he dances with Ruth Lorenzo. I imagine the spaniards are going to put on an amazing set and I think that this song has the potential to go all the way. It would be brilliant to see a non-english song win as well for the first time since 2007. What do you think? Do you agree with my ranking? Please get in touch and tell me who your favourites are. Whoever the winner of the contest is, I hope that they go on to have a very successful career throughout Europe. I won’t be in Vienna this year unfortunately but believe me when I say I am saving up to go all out in 2016. From Baku to London, I will be wherever it is hosted and will look forward to another Eurovision adventure. One month to go everybody, so exciting! 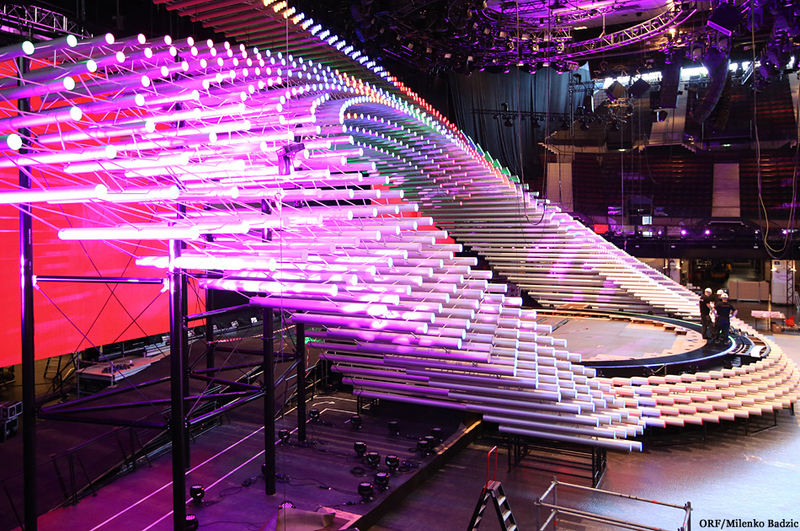 Check out the stage!